Timesheets Lite - Time Tracking Software made easy! Timesheets Lite allows you to record, track, and report accurately on the time that your employees spend on projects. It does this quickly, with low overheads, accurately, and reduces your time to invoicing, and improves your accuracy of invoicing. Recover ALL your chargeable hours! Do you bill by the hour? Time tracking a problem? Want time tracking software on all of your employees computers? Perhaps you're a small company and want free time tracking software, an older version of Timesheets Lite could fit the bill! Timesheets Lite - Free Timesheet Software! There are two versions of Timesheets Lite, an older free timesheet version that has no on-going development and is good for 2-3 users. The commercial version of Timesheets Lite is being developed and improved all the time and is available for you to try without obligation for 30 days. Timesheets Lite can be purchased from our shop. Easy to learn and easy to use time tracking software. Time tracking software has never been quicker to learn or more accurate. Streamline your time tracking process. 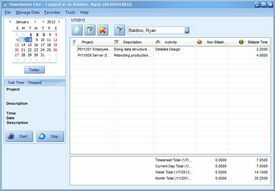 Project Timesheet software to help increase profitability, reduce billing cycles, and help with more accurate quoting. Usable by anyone in your organization with a computer. Store your information centrally for more reliability and truly up-to-date data. 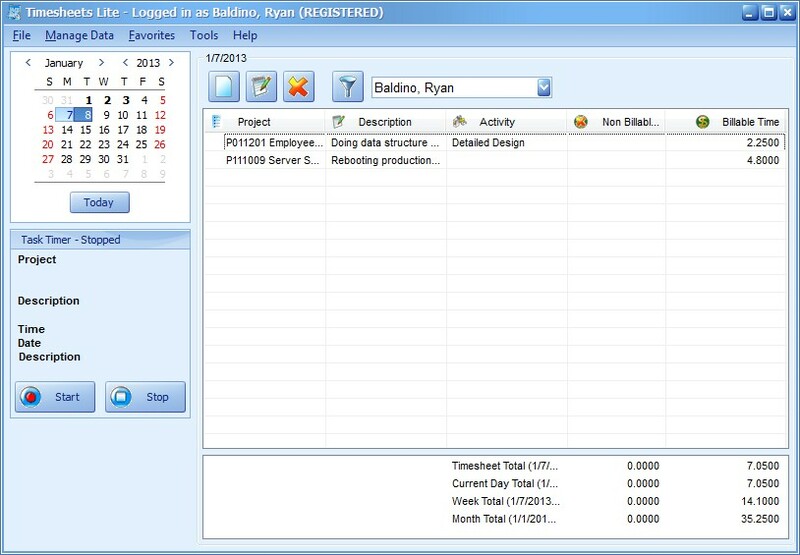 Monitor your projects more accurately using configurable reports. Share data by easily emailing, exporting, and generating reports. Easy to use, simple to administer. An older version can give you free timesheet software! Multi user software storing all of your company timesheet information centrally, meaning that all reports are completely current and up to date. Standard Microsoft Access database backend allowing you to install the software on up to 30 computers. Timesheets Lite can also connect to MySQL or MS SQL Server databases potentially supporting Timesheets Lite on hundreds of computers. Allow employees to book time against projects using the timesheet by entering time spent or actually timing their work using a task timer. Intuitive, fast timesheet entry process. Members of your financial team can generate reports showing time spent by employees on one or many projects for any customer. Mark times as invoiced to track billing, or bill using milestone payments. Project managers can track spend on projects using detailed activity reports showing time spent on their project by day and by employee. All reports can be exported to Excel, PDF, or HTML and can be easily emailed and printed. You can download download Timesheets Lite here. If you have any more questions about Timesheets Lite read the Frequently Asked Questions (FAQ) or email us. For more information on Timesheets Lite please see our detailed Time Tracking Software Features List. Timesheets Lite costs just $49 (US) per license with discounts for more than 10 licenses. Please see our Shop for more information. Copyright © 2002-19 Timesheets MTS Software. All rights reserved.